Greetings guys! It was so crazy last week that as I was sitting in bed last night I thought we were already mid-month. I basically did a normal month's work in one work week. Last week wasn't even a full work week, it was only 4 days! Now you guys know why I was so absolutely nutty. More than normal nutty, I mean. Today I have an indie from long ago, almost exactly a year ago actually. One of the first reviews I ever did was about Doctor Lacquer and today I finally have some more to share. It's been a long year and we have both come so far, needless to say I'm extremely excited to be featuring this indie here again. To be clear, these are three random polishes I selected myself and purchased with a blogger discount. All of these polishes are available for purchase individually, as well as, in complete collection sets. Note: Each polish is from a different collections available! 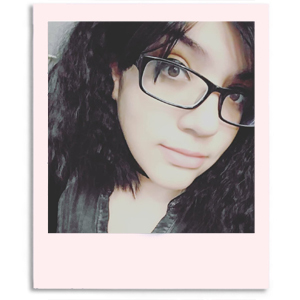 Fashion (Mg)azine is a white crelly with multisized pastel hexes, squares, and pastel dots. If there is anything you've learned about me by now is my love for white crelly polishes is strong. Now while you can layer this beauty on it's own, I found I liked it better over a white base. 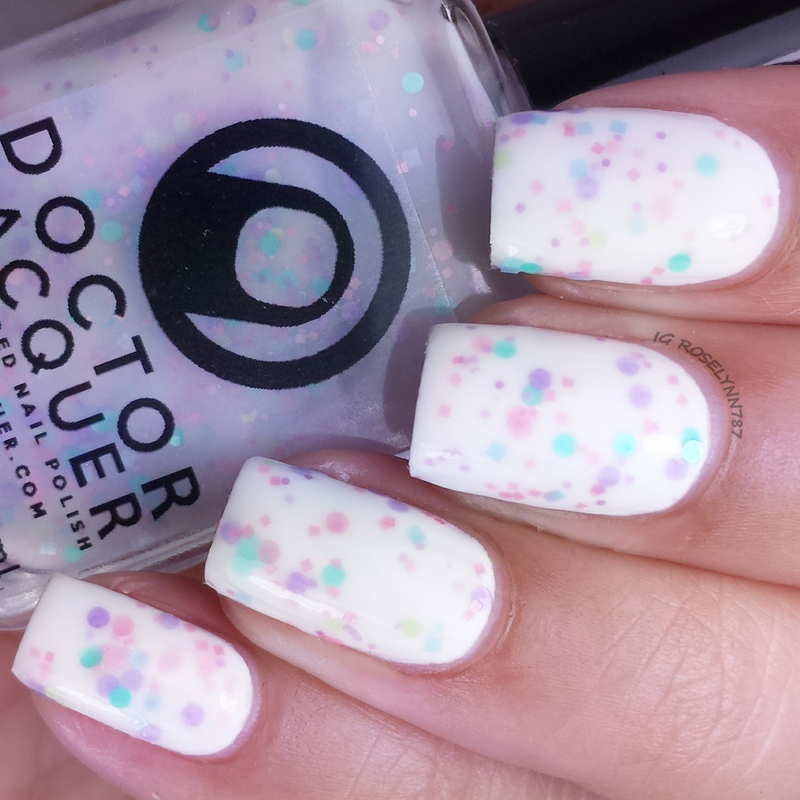 Using a base allowed for less glitter clumping and an overall smoother finish. No glitter fishing whatsoever with this polish. Great formula and consistency. This polish and the entire Elements of Style Collection is on clearance now, grab yours while supplies last for $5.00 each. 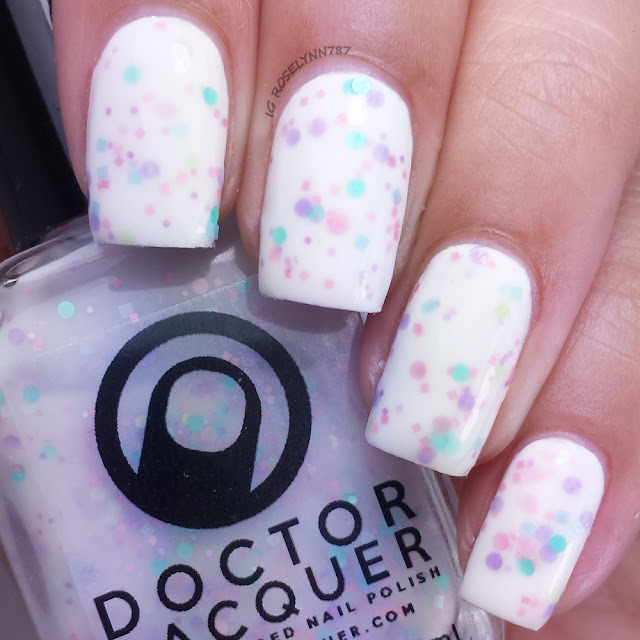 Refraction is a rainbow-colored neon hex filled glitter topper in a clear base. 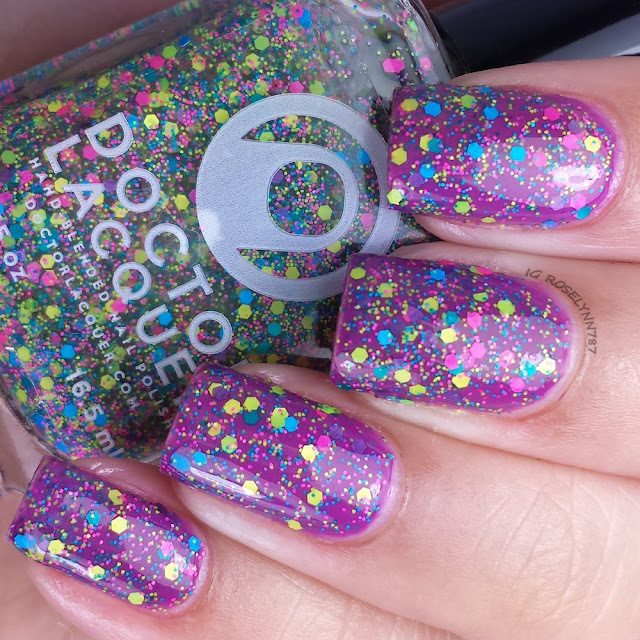 I swatched this glitter polish over Essence Break Through using two thin layers. Excellent formula and consistency. If you use more than two layers, then I'd suggest possibly the dabbing method of applying. This is one of those toppers that saying no glitter fishing is a serve understatement. Refraction is easily one of my favorite toppers of all time. It looks great over so many base colors, imagine a colorful gradient. A lot of possibilities. Royal Luxury is a cold-sensitive carolina blue (warm) to dusty purple (cold) thermal linear holographic polish. Shown in these swatch photos is how it looks when it a warm condition. Unfortunately weather is pretty much unbearable hot and I could not capture this polish in its cold state. As mentioned, this is a cold sensitive polish and takes a lot of effort to change color as opposed to a warm sensitive thermal. Your body temperature needs to be in a cold state to see the difference in color. I stuck my hand in front of the air conditioner for five minutes and it changed color, but by the time I'd stick my hand under the lightbox it'd change back. Color changing aside, the formula and consistency are pretty good. I used two thin layers and achieved the desired opaque finish I wanted. This polish dries matte so I choose to not use a topcoat and show you the natural finish. 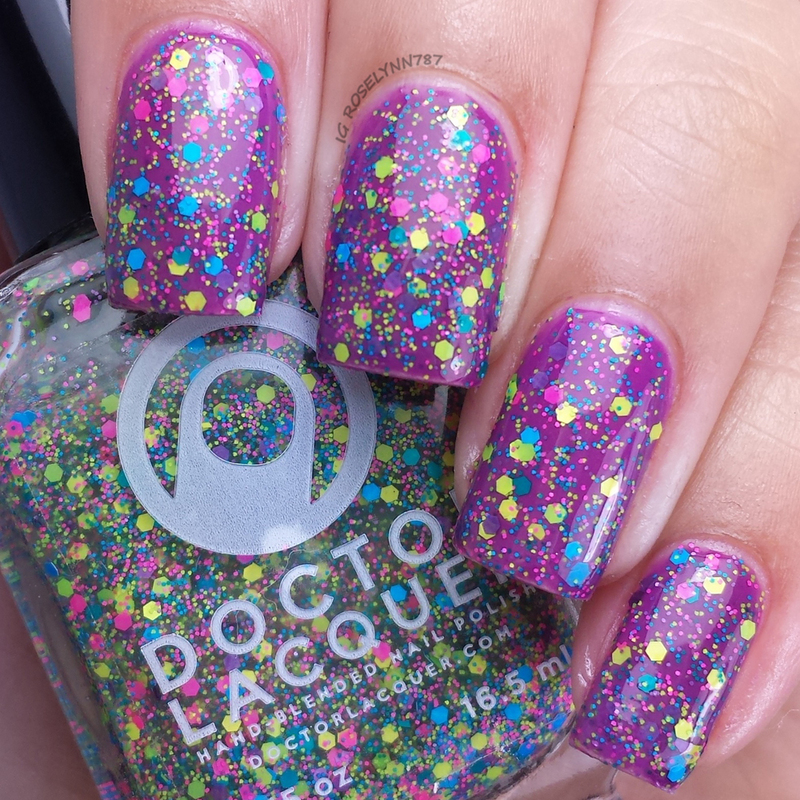 Overall I'm definitely rekindled my flame and love for Doctor Lacquer polishes. The collections are well thought-out and very beautiful. I can't wait till it starts to cool down here because I'll be reswatching Royal Luxury at that point. 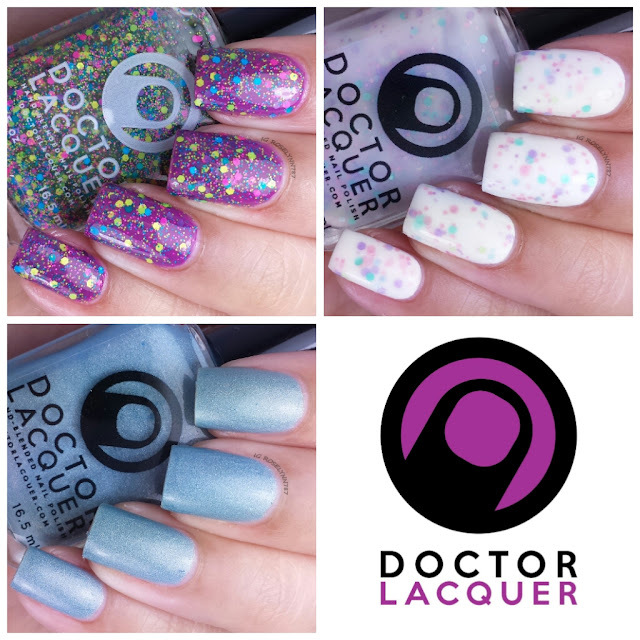 Doctor Lacquer has tons to choose from in store now and also has a new collection releasing very soon. So soon in fact that I believe preorder starts tonight at 9PM eastern time! You guys can check out the previews on her Instagram @doctorlacquer. Thank you sweetie. Yes, that's definitely one of my favorites. The sale price is so good I want to try and pick up the rest of the collection.